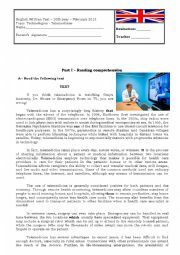 Students will discuss the topic "New Technologies" in groups. 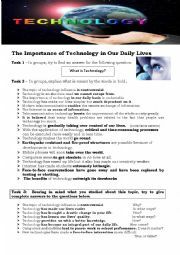 Then, they may work individually or in groups, reflecting on the role new technologies play in our society.This is mainly a worksheet on vocabulary which will help them write a text. I also included two songs that you might find useful to introduce the topic or to develop it. 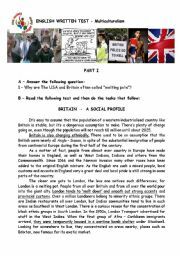 This worksheet is mainly to practise vocabulary on the topic. 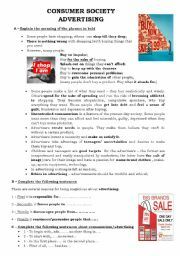 Students have to use their own words to explain the meaning of the phrases in bold.Exercises B and C are intended to help students organise their writing. 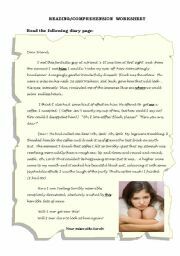 A page of my diary - The texts is about issues related to adolescence. 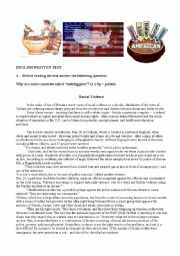 It includes question/answer exercises on the text, completing sentences, finding evidence and reference exercises. Hope it can be of some use to you! Speaking and writing activity about the topic Cloning. 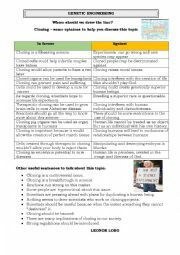 Students can debate this topic by using some of the ideas in the worksheet and then they can write a text stating the advantages and disadvantages of this technique. 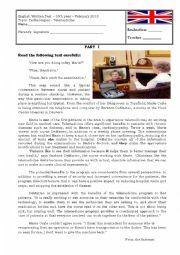 Reading/comprehension and vocabulary exercises on the topic. 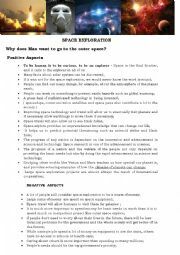 A list of negative and positive points about space exploration to be discussed in class. Space vocabulary exercise (matching words with their definitions) I hope it can be of some use to you. Vocabulary worksheet. 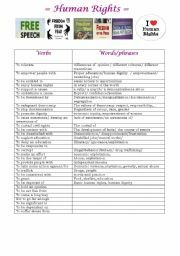 This is a list of words related to HUMAN RIGHTS that students may find useful to speak or write about the topic. It includes some questions about freedom and democracy. I hope it can be of any use to you. Reading/comprehension and vocabulary ezercises on the topic. Grammar: used to, future forms and making predictions.